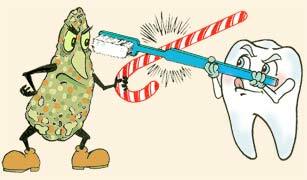 “The terms oral health and general health should not be interpreted as separate entities. Oral health is integral to general health: Oral health means more than healthy teeth and you cannot be healthy without oral health." "Health, welfare, and even life itself, of persons who have heart conditions which predispose to infection may depend upon the prevention and control of dental disease." • The nervous system ... causing neuritis. • The cardiovascular system ... leading to endocarditis, myocarditis, and periocarditis. • The respiratory system ... contributing to everything from sinusitis to lung abscesses." "It is not uncommon to see oral hygiene, which obviously contributes to system (total body) welfare, being totally ignored in a patient who has severe systemic disease." "In a mild case of gum disease, if laid out flat, the total ulcerative (infected) area would cover a postcard. From this rather large area, bacteria and toxins enter the bloodstream whenever food is chewed. This transient bacteremia can affect the total health of the individual." "There is not one thing in preventive medicine as important as oral hygiene and the preservation of the teeth."